7.90 points at 21 votes (rank 101). The FBI is being blackmailed! A central unit of the FBI is controlled by a hostile secret service to get their own spies free. If the FBI does not agree to the claims, the hostile secret service threatens to detonate a bomb that was placed in the upper floor of a hotel. An IT specialist has already been smuggled into the hotel to crack the code of the bomb – unfortunately he was caught before he could finally deactivate the bomb. However, he could hide small hints in the hotel, which enable the next agent that can reach the bomb to deactivate it. So they are looking for an agent that takes over this hard and dangerous mission. To deactivate this bomb you need to fight through all floors until the 62nd floor and examine every corner. Every single hint is important! To complicate matters, you are chased by agents from the hostile secret service. In the house there are masses of elevators through which you have to channel your way to the top and which you can also use to do jinks. Of course you are the one to take over this mission – what else are you an agent for – and to start you enter your name. With a “Good Luck” and your service weapon you are sent on the journey. For the year of creation the graphics are good, detailed and many colours are used. The movements of the characters are most of the time very fluent, whereby e.g. the jump of the agent might put a smile on the face of one or the other. Shot agents fall to the ground and disappear in it. There is no music, but for almost everything there is a sound: the printer, the steps of the agent, the shots, while examining and finding certain items and hints. The demo mode randomly shows different floors. To get the key for the emergency door is a part of the task. Examine all items to get hints about how to deactivate the bomb without getting killed more than 8 times by the hostile agents. The hints are each one of the 4 directions right, left, up, down. These are important later to know how you deactivate the bomb. The hotel is divided into 9 sections. In each section there are 2 hints to be found. To reach further floors and to get into the next section you need the key to the emergency door. It is owned by the porter, who hides behind one of the many blue doors. If you find him, he will liberally hand out the key to you. But to be able to open the blue doors you first need the universal key that is available in every section at the reception. In the biggest part of the screen you see the hotel – here the examining and the shooting takes place. In the lower bar in the middle you see what you have just examined and what happens. Left to it, there is a split display. In the upper part there are the points and below that at the left the number of lives left. The small yellow number shows the floor in which you are. At the far right of the lower bar, there is a big number that shows the countdown of the bomb. It starts at 999. Enter the name by joystick and to confirm the letter. You can choose letters, numbers and special characters. You can examine everything except the flambeaus on the ceiling. That means that also all walls (also the outer ones next to the elevators), candles and all curtains (of which there are loads) can contain hints. Prepare with a pen and paper. It is important to note down the directions that you find. 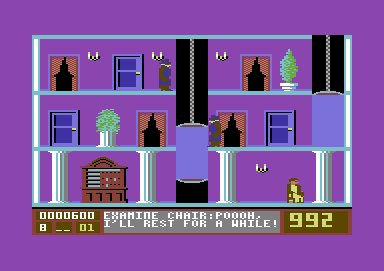 To get into the pause mode, examine a chair – the agent will sit down and the game will be paused. It is decided randomly what hides behind the doors and where the hints are hidden. At first, the reception is right at the start, but you can assume that in the higher floors it is far away so you have to walk back all the floors to check the doors. If you lose all lives or the time has run out before the bomb has been deactivated, the bomb will explode. 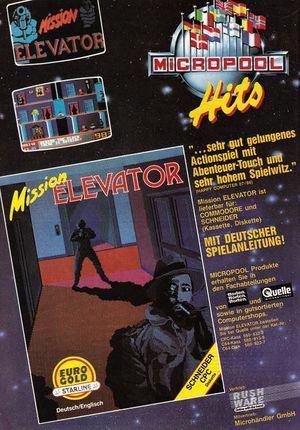 Hostile agents get to the player over the elevators or through curtains. They can also appear just in front or behind you out of the curtains, but not when you stand in front of the curtain. Agents do not come out of floors that you cannot see on the screen. Some agents can also duck and shoot in ducked position. To avoid shots coming out of the ducked position you should jump, to avoid shots coming out of a standing position you can duck or jump. Most agents shoot at the hero, but there are some that stab him to death, when they stand directly next to him. The higher you get in the hotel, the faster the agents are on the ball. It can easily happen that you have to handle 3 trigger-happy agents. Doors can only be opened from the right side. 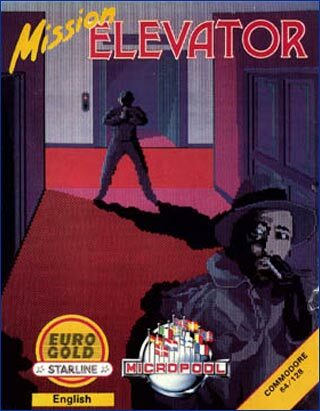 If a door or another item is surrounded directly by elevators, they can only be examined while standing in an elevator. A hostile agent – the doors cannot be closed any more, you should straight away shoot to avoid being killed. A woman – you can either close the door or also (automatic reaction) press the fire button. In the second case the woman will undress, for which you have to pay 100 points. If you have gone through the emergency door you cannot go back. You cannot jump or walk over elevator shafts. 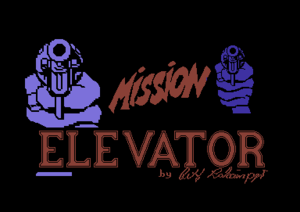 Use the elevators also to avoid shots. As long as the elevator is not occupied it stops at all floors in certain intervals from top to bottom and back. So sometimes you have to wait patiently until the elevator is here. If you are shot while being in an elevator between the floors you reappear on the floor on which you have entered the elevator – and that at the left of the elevator (of course only if that is possible). Every now and then you will see a bar. As you should also search this facility, you will inevitably get in contact with the barkeeper, who invites you for a drink. You can choose between milk, beer and whisky. With the joystick you choose something and confirm it with the fire button. Keep in mind, that alcohol while on duty is not good. In the hotel there are also sockets, which you also need to search. But as we all know it can be rather dangerous to put your finger into a socket, so be careful what you do, or the game is over very quickly. If you examine the fire hose, you use it and extinguish all candles. It gets dark abruptly in the hotel, however, you still can see everything, even the shots that race towards you. It gets light again when you lose a life or when you examine a plant. Behind them you find some matches, by which it gets light again. Each of the long case clocks plays the same melody (anyone who doesn‘t know it?). You can listen to it, when examining the clock. Every now and then you find a small table in the hotel. If you examine it you can make a small game by pressing the fire button. First you choose how many points you want to bet by moving the joystick and confirm this by pressing the fire button. 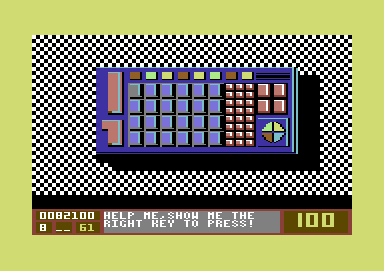 After that you pick a number on the dice, here also you choose the number by joystick and press the fire button for confirmation. Now a second dice is thrown, which you stop by pressing the fire button. If the number hits the one that you have chosen you win the stake, if not the house wins. ... Up for a game? Shooting an agent gets you 200 points. If it is dark you receive 400 points per agent. You can win more points at the dice game. 100 points are lost, when you undress a woman behind a door. Of course you can also lose points at the dice game. When you have deactivated the bomb you are rewarded 100 points. Everything else does not get you any points. When you arrive at the uppermost floor, you can see the bomb from a distance. When you have reached it, you turn to the computer and get your notes with the hints. Camailleon: "The game is creative and has amusing elements. The difficulty level on the other hand is very high, at the beginning the fast reactions that you need, when an agent appears behind you, are still feasible, but the higher you get the more agents work foresighted and you hardly have a chance. What adds to this is that there are up to 5 elevators on a screen, which aggravates advancing as you always have to wait for an elevator. However, it is always fun again. 8 points from me." 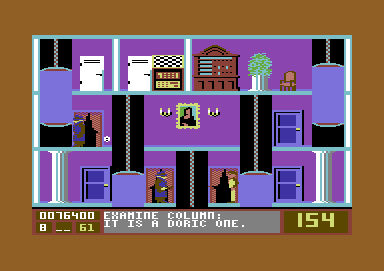 Jodigi: "A very nice diverting game with fast reactions that I not only like to play on the C64 but also on the video machine or on the Gameboy." 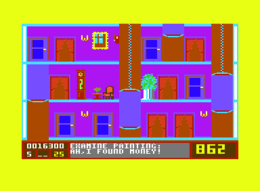 H.T.W: "At first sight the game looks like the game machine "Elevator Action", but through the mixture of arcade adventure and much action it is more intelligent to play. 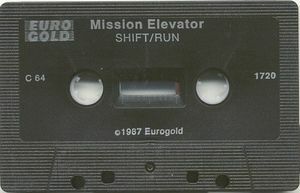 By searching of items (which kind of reminds one of Impossible Mission) and the many small gags (electric shock in sockets, bribing hostile agents, etc.) the game is really fun. Definitely felicitous this game...". Bamse: "A great game, which I always liked to play. Successful mixture of skill, reaction and investigative flair with nice title music and fun factor!" The game is on the collection Power Pack and the Future Games 64 collection. In the version by remember some small hitches were removed. This page was last modified on 23 September 2017, at 23:15.